Start your review of Dave Muscat. Send a message to Dave Muscat. Thank You! Your message has been sent to Dave Muscat at Peel Chrysler Jeep Dodge RAM. Had a great experience, the sales rep took the time to listen and cater to what was desired, and I walked away feeling secured and happy with my great purchase. Thank you for everything, Chad! I have been after a Ram truck for a couple of years. Have made multiple visits to the dealershi; and got close to closing a deal twice. Throughout this - they have been patient, understanding & helpful. Paul K was consistently willing to help in any way he could, to resolve the iseu3s/concerns & wants, I had. We were able to come up with a truck that fitted my needs, & was within my payment parameters. Nice going, guys!! Cathy was amazing to work with and knew exactly what we wanted and made it happen. I would definitely recommend her to help with any future vehicle needs. We love our Ram!!! I've shopped around each time when looking for a vehicle and Peel always has the best prices. Chad was very nice, easy to work with. Dave as well. Very friendly and kind, always got back to me with answers to questions I had before purchasing. Loving my new trailhawk and will definitely recommend Peel to anyone I know looking to buy a vehicle. "Fast professional service with great prices." I went to 5 or 6 different ram truck dealers and peel was by far the easiest to work with. Chad from peel gave me a good trade for my vehicle and a great price on new truck. I recommend getting to peel Chrysler if your looking for a new truck for sure. Bought it Monday and picked it up on Tuesday, perfect. 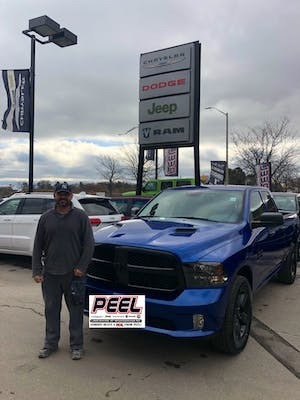 "Purchased a New Ram Rebel"
Last year I was keeping an eye on vehicles as I was enticed by the deals Peel Chrysler had to offer. I wrote a review on Google stating that I never felt pressure to purchase and had great communication from them. 9 months later and completely forgetting about writing that I would consider them for my next vehicle...Voila! Was in the market and low.and behold, found the vehicle I wanted and again had great communication and service from everyone at Peel. Thanks and absolutely LOVING the new RAM REBEL!!! Everyone was very helpful. Sal is a great down to earth guy. He will go above and beyond for you. I was very pleased with all aspects of my car buying experience at Peel Chrysler. Do your self a favour and give Sal a call today! !